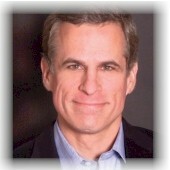 This page is prepared by Prof. Tim Richardson for his students. since in Y2K+ companies with global brands are judged on categories much broader than financial ratios. Professor R.S. Kaplan of Harvard Business School in The Evolution of Management Accounting states : "..... if senior managers place too much emphasis on managing by the financial numbers, the organisation's long term viability becomes threatened." explained by students In a "in-class exercise" Nov 2nd in CCT224 at University of Toronto, Mississauga Campus, the students were divided into groups and discussed "non-financial indicators" using sources and resources they are familiar with. After a generous amount of discussion, we filmed a member of each student group who presented, casually, what the group had concluded. Then two students (Hana Elali and Arun Babber)(raynmagic.com) took these video segments and using an editor, compiled the segments into one long video which we subsequently uploaded to YouTube Nov 28th 2012. 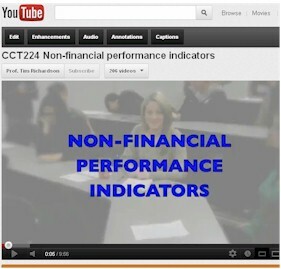 The purpose of the video is to explain Non-Financial Performance Indicators, in simple language, and using examples and situations students are familiar with. basically "things that indicate a company is doing well, or poorly, other than money focused items"
branding Most of the groups in the video discussed things in terms of how you "work your brand" and mentioned things companies can do to cause their brand to be popularized, which in turn effects sales growth and is an indicator of the company's performance. 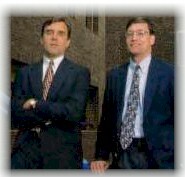 "many managers feel traditional financially oriented systems no longer work adequately"
Ittner and Larcker write "Inadequacies in financial performance measures have led to innovations ranging from non-financial indicators of "intangible assets" and "intellectual capital" to "balanced scorecards" of integrated financial and non-financial measures." Ittner and Larcker explain that "Non-financial measures offer four clear advantages over measurement systems based on financial data." 1. "Financial evaluation systems generally focus on annual or short-term performance against accounting yardsticks. They do not deal with progress relative to customer requirements or competitors, nor other non-financial objectives that may be important in achieving profitability, competitive strength and longer-term strategic goals." 2. "drivers of success in many industries are "intangible assets" such as intellectual capital and customer loyalty, rather than the "hard assets" allowed on to balance sheets. " 3. 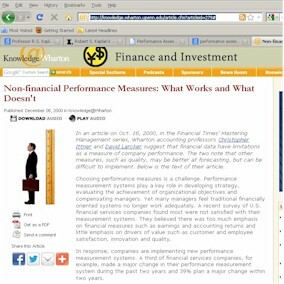 "non-financial measures can be better indicators of future financial performance. Even when the ultimate goal is maximizing financial performance, current financial measures may not capture long-term benefits from decisions made now. Consider, for example, investments in research and development or customer satisfaction programs." 4. "the choice of measures should be based on providing information about managerial actions and the level of "noise" in the measures. Noise refers to changes in the performance measure that are beyond the control of the manager or organization, ranging from changes in the economy to luck (good or bad). Managers must be aware of how much success is due to their actions or they will not have the signals they need to maximize their effect on performance."